Step 1 Place a 3-quart pot over medium-high heat. A 2-quart will do, but the larger pot gives you lots of room to stir. Add the butter and stir until it has melted. Add the onion and stir slowly but constantly until it softens, just for a minute or two. Spear a piece or two and taste if you're in doubt. You don't want to brown the onion, just tenderize it a little. Step 2 Stir in the flour and blend it thoroughly with the butter and onion. Cook, stirring constantly, about 2 or 3 minutes. Slowly add the broth and milk, still stirring constantly, and continue to cook until it is almost to the boiling point. Tiny bubbles will begin to form a ring around the edge of the pot. At this point, stir the grated cheese into the milk and whisk it until it has melted and the soup is very hot. Salt the soup to taste, then serve. In Recipes-list.com we have selected the most viewed recipes from category - Soups Vegetarian . Enjoy the best recipes specially selected for you! 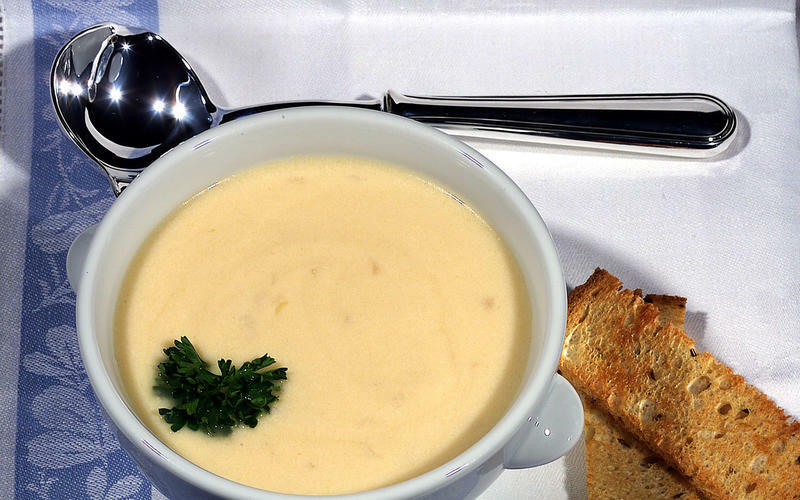 Cheese Soup is the right choice that will satisfy all your claims.